There’s an ancient English saying: “Time and tide wait for no man.” While the origins are unknown, the point is clear. No one has the power to stop the tide and certainly, no one can stop time from moving forward. This might be patently obvious at your firm, you may be dealing with several clients (if not a majority) that are getting closer to retirement or are already beyond retirement. It’s not the age that matters but the complications associated with it that make financial planning a little more difficult. Today we’ll talk about three key issues around aging that affect your clients’ financial future. It’s human nature to put things off until the future. In economics, it’s often referred to as “temporal discounting” that is the idea that we find it more difficult to assign rewards to a future date, but value the here and now very highly. While this generally isn’t a big deal for younger, healthier clients, it can be disastrous for clients who have aged. Sudden death, terminal diseases, or severe complications from illness are far more likely for your older clients. These can have massive impacts on financial planning and need to be taken into account sooner than later. Work with your clients to make sure that if a life-threatening or life-changing situation were to arise suddenly, their finances would be safe and there is a plan in place to deal with them should they be incapacitated. The speed of technological and medical advancement is astounding from a historical perspective. As with anything in our world, however, it doesn’t necessarily come cheap. People, generally, want to live as long as possible. This desire, while perfectly normal, is an issue for those who are unprepared. As your clients age, the likelihood of using life-extending systems rises. Try to have a frank conversation with them to see if they are prepared to spend the money necessary for this infrastructure. If so, work with them to come up with a detailed plan about how it will be paid for and who will be in charge of managing it if they are unable. Beyond paying for life-extending treatments, it’s important that clients have a plan in place for living longer and the cumulative expenses that come with daily living. Living longer is something a lot of people strive for, but don’t necessarily plan for financially. Alzheimer’s, dementia, and other cognitive failures are not uncommon as clients age. These horrible diseases rob people of so much more than just their memory. While it’s not guaranteed that your client will succumb to one of these diseases, it is certain that their vulnerability rises as they age. Protections can be put in place while they are in a sturdy state-of-mind to safeguard their assets from scammers, unwitting or malicious family members, or themselves. 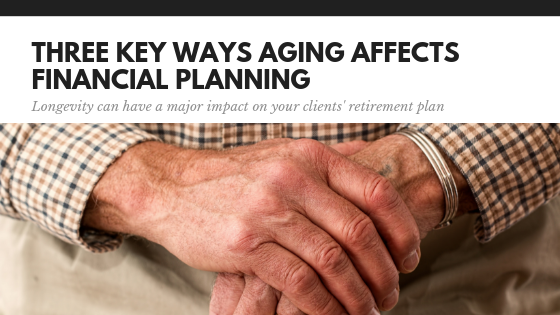 Explore these options so you and your client can have a hedge on Father Time. As with all clients, try to imagine yourself in their situation and ask “What would I do to best protect my assets.” This will give you a good level of empathy for their situation and help you collaborate on the best outcome for all parties. To get a better understanding of the unique longevity timeline and financial needs of your clients, schedule a HALO consultation today.